September is Ann Arbor's 1st Local Food Month! A perfect recipe to combine those abundant end of summer veggies. This quick and easy version makes a large batch, about 10 cups, enough to eat some this week plus freeze the rest to eat later during the winter. You could also add diced chicken, sauteed firm tofu, tempeh, and more seasonal vegetables (next time I will add some fresh corn cut off the cob). The dish may be topped with grated cheese at the time of serving, or put the grated cheese into a side dish so that vegans can pass if desired. I saved about 1 cup to cook with salmon tomorrow and froze the rest in 2-1 quart containers. It was a year ago that I wrote a tribute to my friend Mona who died of breast cancer. Yesterday another dear friend died of the same disease, way too young, with much too much of life still ahead. I only learned how gravely ill Sue was on Sunday night, admitted to the ICU at a medical center where I used to work, where I trained Sue as a student dietitian 30 years ago, and where she worked for her entire career as an exemplary trauma/burn/critical care dietitian, including for as much as possible and as long as possible even after her cancer had returned. When I called the ICU on Monday morning, I learned from her nurse that Sue's out of town family had arrived the day before, death was expected that day, and her family was requesting no visitors. Respecting their wishes for privacy, I asked the nurse to tell Sue I loved her, cried most of the day, and did not make the drive down to the medical center where I had sat alone in the waiting room twice during Sue's surgeries. Later in the afternoon, I made some calls for an update and left my name and phone number to be called with further updates. I drove to my community garden early this morning having not yet heard any news. As I picked the last of our tomatoes and some baby kale, I kept thinking about how much Sue loved her home and her gardens, remembering how much time the two of us spent in her yard and looking at gardening magazines for ideas of what else to plant or rearrange. Sue and I also birded together and shared as many happy birding experiences as we did with gardening. Therefore, when I saw the following two birding sights while driving home after leaving my garden, I knew in my heart that my friend had passed away during the night, that she was safe, and that she was now truly on her way home. First, while crossing the river that runs through Ann Arbor, I saw a very large group of turkey vultures circling higher and higher right next to the road I use to drive home. Vultures gather into large groups in the fall before migrating south for the winter where finding food will be easier for them during the colder months of the year. As a group, they circle on warm air thermals referred to as "kettles" because, when in this formation, the vultures give the appearance of rising bubbles in a boiling kettle of water. When seeing this kettle, I immediately wondered if Sue had died during the night and was now with a group of friends, relatives, and even former patients who were all supporting her and showing her the way to a land where she would be cancer-free, pain-free, and worry-free. In addition, as I glanced at the vulture at the top of the kettle, I was thinking of the image of bubbles rising to the top of a boiling pot and breaking free. The turkey vulture’s scientific name is Cathartes aura, which is Latin for "cleansing breeze". I can think of no better image for a person finally breaking free of "the stink of cancer". 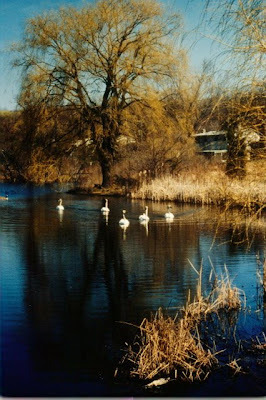 Sue knew of my love of swans and my attachment to them for both good luck and healing. The last time we went birding together at Crane Creek and Magee Marsh during the spring 2008 migration, warblers were all around us at these two famous birding "hot spots", but we stopped to soak in the magnificent view of a flock of trumpeter swans, knowing we were seeing a special sight. So when I arrived home to have my husband tell me that I had received two phone calls with the news of Sue's passing last night, I was not surprised. I was not able to personally tell Sue "good-bye, good luck, you're free", but I know that lone swan came to tell me that my friend was now free and on her way home. I loved to introduce Sue to both friends and colleagues as the best student I ever had, which embarrassed her no end. It is the truth, and it was an honor to have had a student who helped her teacher (me) grow professionally, and best yet, then became a life-long friend. We shared so many interests, so many thoughts, did so many things together these past 30 years. It is painful to think of not continuing to grow old together as friends. Yes, cancer stinks, it really stinks, and I could use many more less polite words. God speed my friend. Ride those thermals high and wide with ease, in the support of those whose lives have also been cut short. Fly on to warmth, great food and wine, beauty, and true freedom. We'll meet again when it's my turn to fly home, and I know you'll be there to be one of my guides. I found out this morning that my alma mater (The University of Wisconsin-Madison, where I did my dietetic internship and received my MS in Nutritional Sciences) has instituted their first campus wide 'common book' with their Go Big Read! program featuring In Defense of Food by Michael Pollan. This book was chosen by popular demand and is sure to provide considerable discussion at a land-grant university where the focus of education, research, and outreach have historically been an influential factor in the "get big or get out" direction of agriculture. Indeed, I hope there are some thoughtful, and even uncomfortable, discussions within the Nutritional Sciences Department with the reading of this book on campus as those faculty are currently participating within a much larger effort called for by the Dean of UW's College of Agriculture and Life Sciences (CALS) for all departments and faculty members to review and reorganize all of their efforts in order to best address the future sustainability of our country's food and agricultural system. Secondly, Michael Pollan (also the author of The Omnivore's Dilemma) wrote an op-ed article printed in today's New York Times that finally calls out loud and clear, in black and white for all to read, the urgent changes needed in our country's food and agricultural systems in order to achieve the hoped for benefits of health care reform (which is currently spending 75% of all health care dollars on 'disease care' due in large part to our country's broken food and agricultural system). Yes, the time is now. If not now, when? Have you heard the quotation by William McDonough who is noted for saying "If you want to go to Mexico, and you're driving toward Canada, even if you slow down, you're still going to Canada." Just changing anything about health care is not enough, it is only the first step, it is just "slowing down" on the road on which we are going the wrong direction with our current 'agri-business' and non-sustainable food systems. I urge you to read Michael Pollan's article. It is short (for Michael Pollan) and to the point. It finally calls out "the elephant in the living room" that can be ignored only by averting our eyes and ears when someone finally says "but the emperor has no clothes on!" Health care reform will not bring this country back to health or wealth unless it is paired simultaneously with true prevention by changing our food and agricultural policies and providing full funding to those that promote affordable, clean, healthy, and just food for all. Enough from me - I don't even know how to 'categorize' this post! Please go read Michael Pollan's article if you haven't already done so. :-) Then, if you are so inspired (I was! ), please write President Obama, your senators, and your congressional representative to urge them to look at the very very very big picture and do everything possible to promote true health and wellness in this country. Only then will our nation truly thrive. Last evening, I was listening to one of my favorite radio programs, The Folk Sampler, a long-running show hosted by Mike Flynn in Siloam Springs, Arkansas. (I listen to it over the web from www.wkar.org.) In Mike's introductory comments for this Labor Day show featuring new and classic folk songs about people and their work, I couldn't help but smile when he said that the only thing consistently found to be associated with long life is enjoying work (I'm likely paraphrasing here). Here are a few great quotes about work that I like. On this Labor Day and every day, please remember and give thanks for all who derive pleasure by the work of growing your food and getting it to you! Did you know that Michigan has the 2nd most diverse agricultural production of actual food that we eat (not commodity crops)? No? You're not alone. Most people don't know that Michigan is 2nd only to California in terms of the large number of different types of food grown in the state (everything from asparagus to zucchini with lots in between!). Yes, this is a big deal, big enough to show off what is being done in our area and show off the tireless work of many local citizens who are passionate about building our local community, our region, and our economy with good (make that great!) locally grown foods. Join the University of Michigan's Matthei Botanical Gardens Local Table at one of their many many programs. I picked up my local foods 'passport' today and got my first stamp from Farmer John of My Family Farm at The Ann Arbor Farmers' Market this morning. In addition, here is a run-down of what is going on in Ann Arbor during September that is being sponsored by Slow Food Huron Valley! working on three major events that are all just around the corner. Please come, bring a friend and tell a neighbor. re-making a good, clean and fair food system. Announcing our LOCAL FOOD ACTION HERO AWARDS AND SCREENING OF CHRIS BEDFORD'S NEW FILM: "COMING HOME"
is thrilled to announce our first ever Local Food Action Hero Award. building efforts in our own area. new Grange Kitchen and Bar at 118 W. Liberty Street! invite you to join us for this fun, family potluck and advocacy event. Congress. The more people come out, the stronger our voice! gaining in popularity, and the time has come to make a change. Ann Arbor Farmers Market, 315 Detroit St.
(and pleasure!) of eating from our own foodshed. Entry is free. Garden Tent — new this year! vegetables and get your face painted like an ear of corn. Month promotes all of these goals. citizens of Ann Arbor to engage in our local foodshed.